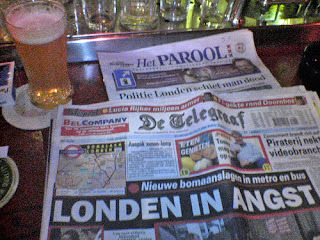 De Telegraaf is the Netherlands' largest daily paper. They're also building up quite a system of websites (including a 40 percent stake in GeenStijl), and today they announced they bought 70 percent of "Webregio Media," a 'hyper local' website network. "Despite the constant care and attention that we give to the composition of these sites, it's possible that the information that's published is incomplete or actually wrong. Mistakes in processing information cannot always be avoided." "We can't be held responsible that the information published is fit for the purpose for which you are examining it. All information, products and services are offered in the state in which they currently find themselves and without any implicit guarantee or protection with respect to their properness or appropriateness for a certain aim or otherwise." "With an eye to all this, the reader is always advised to seek independent information and or to investigate information gotten from one of the Telegraaf's sites before using it." At least they're honest, in their own ... idiom. 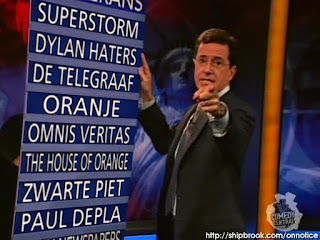 De Telegraaf is also famous for having been "wrong in the war," as the Dutch put it. That means, they worked with the Nazi occupiers during WWII. I've always been curious how they managed to thrive despite that, while papers like Amsterdam's daily, "Het Parool," the resistance paper, are slowly decaying.